For a majority of parents, this is the month kids go back to school. With that comes PTA meetings, school fundraisers, and team sports. There are countless ways to raise money for organizations, but one of the easiest has to be TeeSpring. Take 10 minutes to design a shirt on their website, share a link to the fundraiser campaign, set your t shirt price, and watch the dollars add up for your organization. Visit TeeSpring’s site to learn about the clever campaigns being run right now. In the past I have seen a couple raise funds for their upcoming adoption with a cute family-focused t-shirt design. Others have included shirts for charitable organizations, promoting websites, and more. Earn a little bit of money or thousands of dollars with this easy fundraising website. The best part about TeeSpring is there are no up-front fees, no shipping expenses, and no risk. Design the shirt, promote the link to buy, and then, if you hit the quantity goal you set, supporters will then be charged, and shipped the shirt directly from TeeSpring. It could not be simpler! 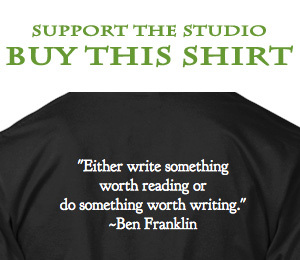 The ad shared here is one I created to promote a shirt for the social media site for writers, Studio30 Plus. It was a great experience using the site as well as working with their customer service team. What I learned from actually running my own campaign is to set a low t-shirt goal (if you don’t hit your goal, you don’t make any money) and spread the word about your upcoming campaign before kicking it off. That way people are on board with ordering in the timeframe set for the campaign. I recommend TeeSpring for your next fundraiser. Give it a try; you have nothing to lose. I was disappointed too, Joe. Hopefully we will be successful the next time we have something like that. It’s a great crowdfunding idea!